As of April 1, Age Smilde is Editor-in-Chief of the Journal of Chemometrics. He will be responsible - together with the editors and the editorial board members - for the scientific content of the Journal. As of November 2017, Age Smilde is a member of the Editorial Advisory Board of Metabolites. The paper entitled Covariances Simultaneous Component Analysis: a new method within a framework for modeling covariances, authored by Age K. Smilde, Marieke E. Timmerman, Edoardo Saccenti, Jeroen J. Jansen and Huub C. J. Hoefsloot, J. Chemom., 2015, volume 29, pages 277-288, has been selected as the winner of the 2017 Kowalski prize for the "Best Application Paper" published in the Journal of Chemometrics in 2015 and 2016. The selection committee was unanimous in its decision and noted that this paper represents an important work in the field of -omics with a significant likelihood that COVSCA will become widely used. In reaching its decision, the selection committee noted that the paper describes a new, alternative method for modeling covariance structures from multiblock data sets in a way that simplifies the overall model and relationships among different blocks. The selection committee noted that paper is well written, and as such has the potential to find wide application in metabolomics and systems biology. Hoogleraren Robert Hall (Wageningen Universiteit & Researchcentrum), Thomas Hankemeier (Universiteit Leiden) en Age Smilde (Universiteit van Amsterdam) hebben een Technology Area (TA)-premie van NWO ontvangen om samen met DSM en Unilever onderzoek te doen naar het smaakprofiel van voedingsproducten. Het programma 'Proeven door Meten' is opgezet om op rationelere gronden formuleringen voor voedingsmiddelen en productieprocessen te ontwerpen en te optimaliseren. Tot nu toe gebeurde dat deels door trial-and-error. Smaak en geur, twee van de belangrijkste aspecten van voeding berusten op het samenspel van vele chemische componenten. Begrip van de relatie tussen chemie, smaak en geur zal leiden tot nieuwe voedingsproducten met intensievere smaakbelevingen. De onderzoekers gaan samen met ingrediënten producent DSM, voedingsmiddelenproducent Unilever, drie promovendi, een postdoc en twee technici de complexe matrix van bepaalde voedingsmiddelen bestuderen. Hierbij wordt niet alleen aandacht besteed aan 'goede' smaak- en geurmoleculen, maar ook aan 'slechte' die bijvoorbeeld als zogenoemde 'off-flavors' kunnen ontstaan tijdens suboptimale bewaring. Het doel is om door het meten van - slim gekozen - chemische componenten de dynamiek van het smaakprofiel van voedingsmiddelen te voorspellen. 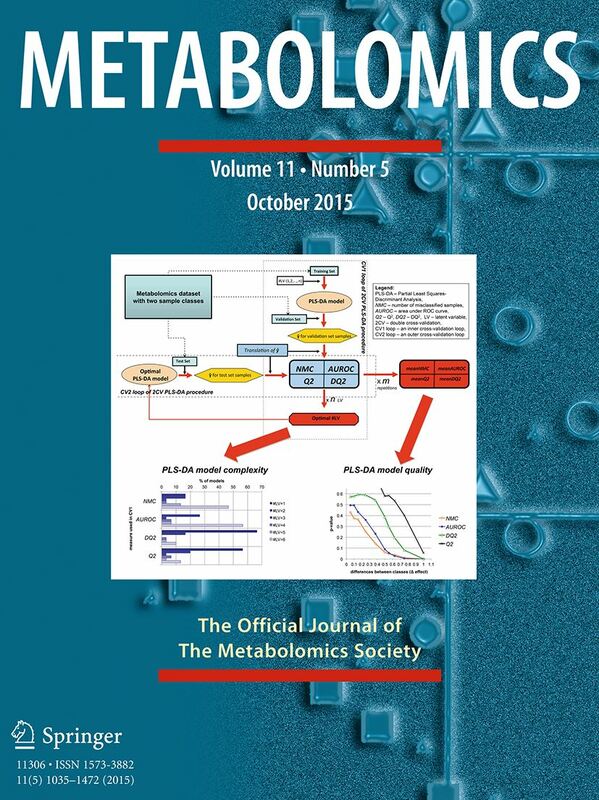 The award winning paper by Ewa Szymańska and her collegues from the BDA group received extra attention when it featured on the front page of the October issue of Metabolomics. 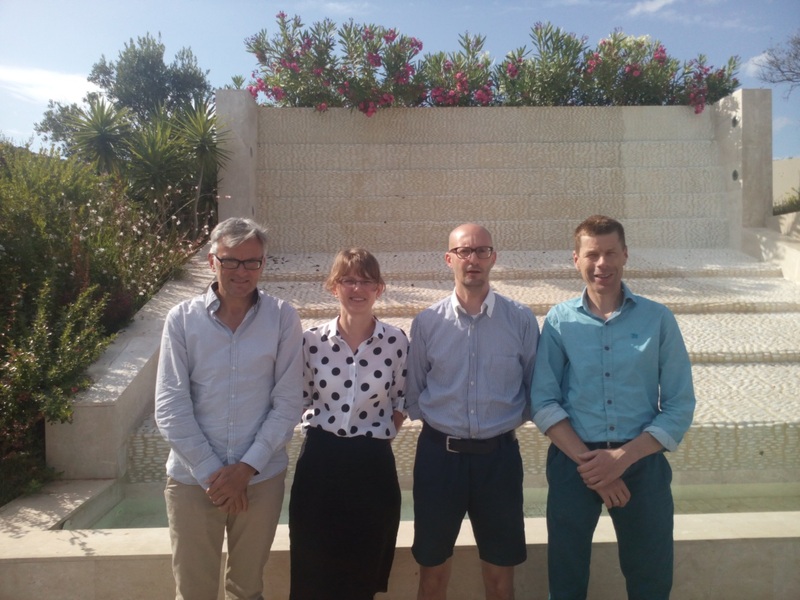 The paper of Ewa Szymańska, Edo Saccenti, Age Smilde and Johan Westerhuis, on validation of diagnostic statistics for PLS-DA models in metabolomics studies, received the 2014 Best Paper award of the Metabolomics Society for the highest total number of citations during the previous three years. The Metabolomics Society's Publication AwardsM recognize outstanding scientific publications within the Metabolomics journal. 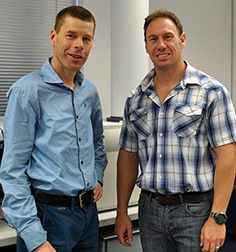 Johan Westerhuis extends collaboration with NWU Faculty of Natural Sciences' School of Physical and Chemical Sciences. Johan Westerhuis received two Metabolomic Society publication awards, the 2013 Highest Download Award and the Pre-2013 Best Paper Award. Johan Westerhuis was recently appointed extraordinary professor at North-West University in Potchefstroom, South Africa. In his position as extraordinary professor he will be the promotor of Mari van Reenen MSc who studies the metabole effects of acute alcohol abuse. The picture shows Johan Westerhuis (right) with Mari van Reenen (left) and her co-promotor professor Carools Reinecke of NWU. Beethovens deafness is well known, but what were the effects of his deteriorating hearing on his music? Find out more here. On October 13th Ewoud van Velzen (Unilever, Vlaardingen) received the I.M. Kolthoff Award for his PhD thesis entitled Nutrikinetics. The I.M. Kolthoff Award was handed out at Labtechnology/TAC2011 under auspices of the Royal Dutch Chemical Society (KNCV) for best PhD thesis in analytical chemistry over the period 2007-2011. Ewoud's PhD project was carried out under supervision of Age Smilde, Johan Westerhuis of the BDA group of the University of Amsterdam and John van Duynhoven (Unilever) within the EU Gutsystem project (coordinator Elaine Vaughan, Unilever) and the Nutrtion and Health theme of the Netherlands Metabolomics Centre. The thesis work was carried out within a (EU-funded) part-time secondment of Ewoud from Unilever to the University of Amsterdam. Within this thesis Ewoud introduced the concept of nutrikinetics and demonstrated it within the context of nutritional metabolomics studies. The I.M. 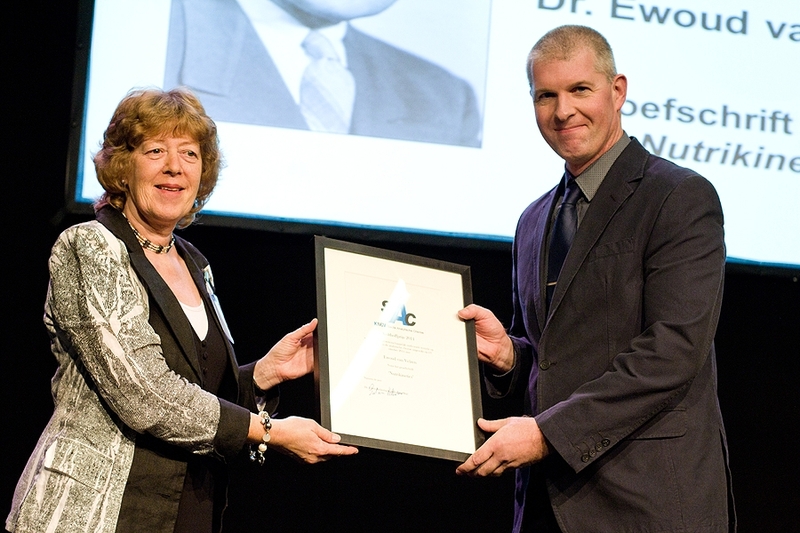 Kolthoff Award is a recognition of the high quality, novelty and productivity of Ewoud's thesis as well as his demonstrated ability to advance the field of analytical chemistry. During the 2010 Eastern Analytical Symposium Johan Westerhuis received the EAS Award for Outstanding Achievements in Chemometrics. With his poster Difference in metabolic phenotype and urinary kinetics of flavonoid metabolites in humans after a black tea and grape juice/red wine intervention Ewoud van Velzen convinced the jury and was awarded with the best poster prize at the 4th International Conference on Polyphenols and Health (ICPH 2009) which was held in Yorkshire England from 7-11 December 2009. His work receives a lot of attention with oral presentations at Metabolics 2009 and Metabolomics and More 2010. Diana Hendrickx was awarded the Hissink prize for the best 2008 MSc thesis in the field of soil science. Diana received the prize on October 2 for her thesis entitled "Karakterisatie en stimulatie van het afbraakpotentieel van vluchtige organische chloorkoolwaterstoffen in de aquifer van de Zenne-site te Vilvoorde-Machelen". On the 13th September 2009, in Łódź, Poland, Ewa Szymanska received the Best Thesis award for her PhD thesis entitled "Metabolic profiles of urinary nucleosides in urogenital tract cancer diseases". The award is given by Committee on Analytical Chemistry of Polish Academy of Sciences and is given every year for the best Ph.D. thesis in the area of chemical metrology. The award was sponsored by LGC Standards and was given during 52nd Polish Chemical Society Congress.